Veneers are a great treatment options for teeth which are stained, chipped, or have gaps. Veneers are an irreversible treatment, so having them placed is a big decision. 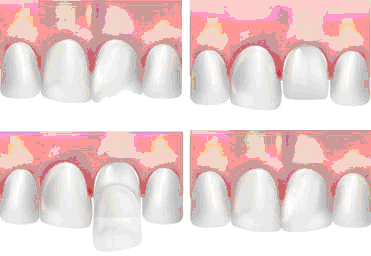 It is important to have all the information about veneers before going ahead with treatment. A veneer is a thin piece of porcelain which is bonded onto the tooth’s original enamel. The piece of porcelain is custom made to contour your teeth and can be used to correct small misalignments, close gaps, change shape and the colour of teeth. Veneers can last between 10 and 15 years. They will eventually need to be replaced at some point. Regular brushing and flossing as well as regular dental check ups will ensure that the veneers last as long as possible. What is the procedure for Veneers? Generally the veneers are completed over two appointments. At the first stage the teeth are prepared and an impression is taken of the teeth. This impression is sent to a dental laboratory who will construct the custom made dental veneers by hand. At this appointment provisional veneers are placed. The next appointment is around two weeks later. At this stage the provisional veneers are removed and the permanent veneers are cemented into place.